After a day of exploring the city, retreat into the cozy living room and lounge on a leather armchair. As you stream your Netflix favorites on the Smart TV, you'll be just steps from the fully equipped kitchen. Complete with state-of-the-art appliances and expansive countertops, the kitchen has everything you'll need to cook like an Iron Chef. Looking to elevate your meal? 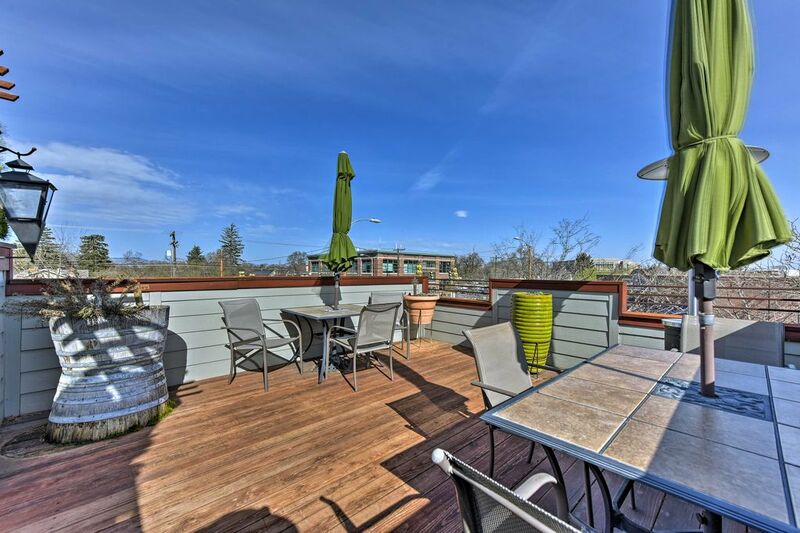 Enjoy it al fresco on the furnished deck. Overlooking the city and boasting a dining table for 4, the 700-square-foot deck is sure to be the centerpiece of your stay. When it's time to hit the hay, head into the bedroom and let the plush queen bed usher you to sleep. With a flat-screen Smart TV and deck access, the living room boasts a unique combination of comfort and elegance. Be sure to leave some extra space in your suitcase for all of the unique souvenirs you're sure to buy. Sitting just down the street from locally owned shops like Bluebird Candy Company and Earthly Awakenings, 'The Loft on Center' gives guests an authentic Logan experience and access to top-notch stores. Don't feel like cooking? No problem, take a short walk to Main Street and dine in style. Whether you choose to feast on sandwiches at Elements Restaurant or enjoy international flavors at Sabores Cuisine, you're sure to return home full and happy. Excite your inner outdoorsman with a trip to Bear Lake. Located just 40 miles from the property, this large lake is a boating and fishing destination in the summer and ice fishing and snowmobile destination in the winter! One of the area's most popular attractions, the American West Heritage Center, sits just 10 minutes down the road. Boasting interactive exhibits and seasonal events, the Heritage Center gives visitors a taste of life as a pioneer. - Amenities include a fully equipped kitchen, furnished deck, city views, 2 flat-screen Smart TVs, reserved parking for 1 vehicle, free WiFi, and more! We have stayed in many VRBO rentals and this was by far the best. Every comfort and detail was attended to from beginning to end. The apartment is beautifully and comfortably decorated with more amenities than you have in your own home from toiletries to kitchen tools and the delicious provisions for breakfast and snacks. We will definitely stay here again and highly recommend. Don’t miss as out on a visit to Anita’s gift shop downstairs and a chance to get an insiders perspective on the town and the area attractions. So many extra touches that made this feel like home! Loved enjoying the summer nights on the rooftop deck! The owners really went above & beyond in creating this space for guests. If you are visiting Logan be sure to stay at The Loft. It has all the comforts of home and the rooftop deck is amazing. Great for small gatherings if you are visiting your college student. Also, there are many good restaurants and shops within walking distance. Having the house stocked with snacks and breakfast foods is a very nice touch especially for late arrivals. This may have been our first visit but it certainly won't be our last! Stop searching, you've just found the best place to stay in Logan! We stayed at the loft for 3 nights while dropping off our Daughter at USU. Jerry and Anita are doing this VRBO thing right! I've been to many, and this is one of the best. The location, ease of communication, amenities (They thought of everything. ), cleanliness, and decor are just some of the things we loved about it . The generous welcome treats and breakfast items were very much appreciated! The deck is an awesome bonus that you won't find anywhere else! We truly felt at home at the loft, and were able to relax in comfort while there. We are so glad we already have it booked for our next visit to Logan! We loved The Loft--the location, peacefulness, decor were all perfect for our anniversary trip. The Loft was cozy and so cute! My husband and I loved every detail. Very accommodating. Comfortable. Well stocked. The Loft had everything you would need or want!